When you think about your wedding day, you want everything to be perfect, down to every last detail. At the Italian American Community Center, we envision the same for your wedding day. That’s why we offer a top-notch Rochester wedding venue and event facility. Our Grand Ballroom can accommodate up to 280 guests as they enjoy our luxurious facilities, complemented by a balcony with breathtaking views of the Rochester area. The IACC makes your wedding an affair to remember and one that your guests will be talking about for years to come. As the Empire State’s third-largest metropolitan area, Rochester is the perfect location for your wedding. Located on the southern shore of Lake Ontario, Rochester is rich in history and is home to several museums including the estate of Kodak film founder, George Eastman. 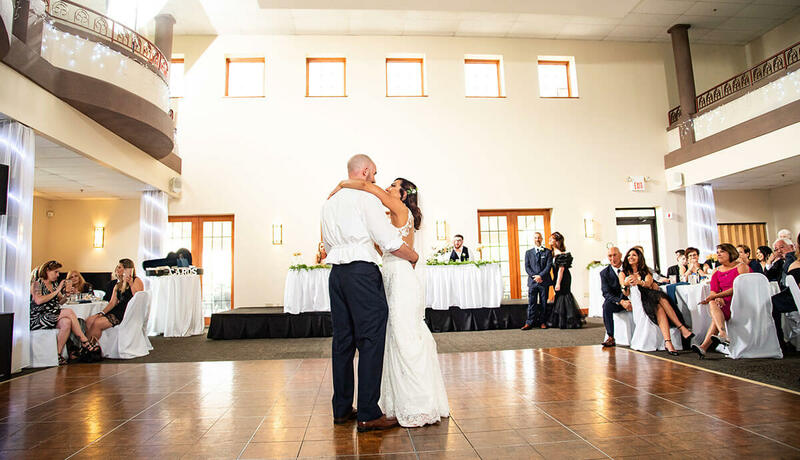 The IACC is located just ten minutes away from Rochester International Airport, making it convenient for any out of town guests who need to book a flight for your wedding. There are many area hotels that can accommodate your guests as they celebrate your special day. When you book your wedding at the IACC, your guests can plan a weekend getaway as they explore the Rochester area. Why IACC for your wedding day? As your guests explore the vibrant activities Rochester has to offer, you can have peace of mind knowing your wedding day is being taken care of by our experts. When you book your wedding at the IACC, you can enjoy having an event coordinator with you on the day of your wedding to make sure everything goes as plans. You will also have access to all of the amenities the Grand Ballroom has to offer, including column and stationary table lighting. Explore our vast menu that can accommodate a buffet or a sit-down dinner. Many couples love the exquisite balcony of the Grand Ballroom because there’s no better backdrop for wedding photos to cherish for a lifetime. There’s no need to find another location to take your wedding photos because the grounds at the IACC are picture-perfect. You can even have your wedding ceremony on the grounds for a lovely outdoor ceremony that ties in the beauty of Rochester with the elegance of the IACC. Let us help you plan the wedding of your dreams! From an exquisite venue to mouthwatering food, we can make sure every detail of your wedding is just as you envisioned it. If you’re ready to let us plan your dream wedding, contact the Italian American Community Center today at 585-594-8882. Let us show you why we are considered experts when it comes to wedding planning!